Old Testament - Today we come to the end of Moses' life in our readings! And - we come to the end of Moses' writings of the first five books of the Old Testament - the Pentateuch: Genesis, Exodus, Leviticus, Numbers, and Deuteronomy. I will miss reading Moses' writings - but - we only have to wait until January 1 next year when we will all embark on the Chronological or One Year Bible adventure and read Moses' writings once again, right?? 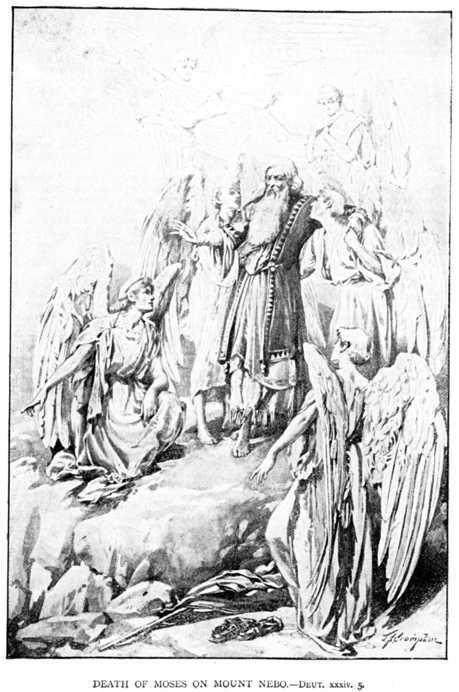 :) An image for Deuteronomy chapter 34 verses 5 through 7 is below: "So Moses, the servant of the LORD, died there in the land of Moab, just as the LORD had said. He was buried in a valley near Beth-peor in Moab, but to this day no one knows the exact place. Moses was 120 years old when he died, yet his eyesight was clear, and he was as strong as ever." Today we begin the book of Joshua! Date: Either fourteenth century or twelfth century B.C. Content: After the death of Moses, the leadership of the nation passed into the hands of Joshua and he was their commander-in-chief throughout the entire time of conquest when Israel was taking over the land. 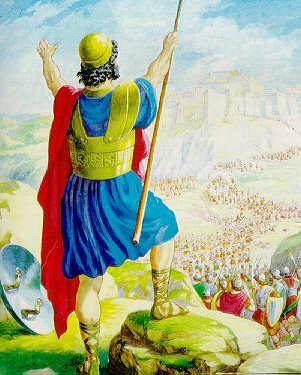 While still in the plains of Moab, Joshua mobilized his forces and prepared them for battle. There were three campaigns fought, one in the north, one in the central region, and one in the south, and all described, though not fully. After the initial victories, the land was divided among the various tribes of Israel. Joshua then exhorted the people and died in peace. Theme: The book of Joshua shows that God is true to his promise. He had promised his people a land and they were now entering in to possess it. However, it was not automatic; God required of them that they actively engage in warfare in order to gain what he had given them. God's judgment upon the sin of the Canaanites in the form of Israel's armies is also a prominent feature. (Above commentary is from "The One Year Bible Companion" pp. 3-4)More commentary on Joshua is at this link. 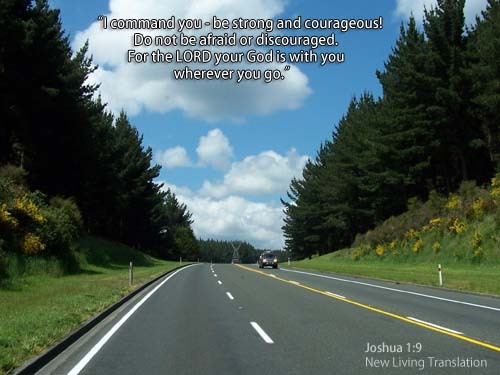 Today in Joshua chapter 1 verse 9 we read one of my favorite verses in the Bible – "Have I not commanded you? Be strong and courageous. Do not be terrified; do not be discouraged, for the LORD your God will be with you wherever you go." Incredible verse! God spoke these words to Joshua just before he was about to lead the Israelites into the Promised Land. And I do believe these words can apply to us today in our lives as well. Do you believe it is possible that God has commanded you to be strong and courageous? In what areas of your life might you need to really hear this command from God? Do you believe that God will be with you wherever you go? 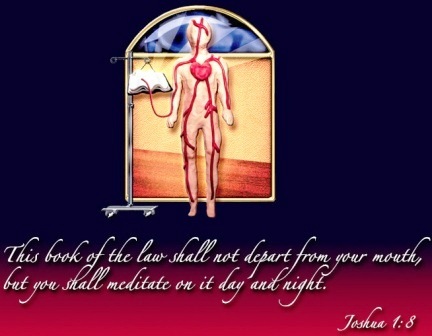 In verse 8 – just one verse prior to the verse above – we read – "Do not let this Book of the Law depart from your mouth; meditate on it day and night, so that you may be careful to do everything written in it. Then you will be prosperous and successful." How does this verse speak to you today? Is it possible that you should not let the Bible depart from your mouth? Do you meditate on the Bible day and night, so that you are careful to do what is written in it? Do you believe meditating and following the truth of God as described in the Bible will allow you to be prosperous and successful? Today in Joshua chapter 2 we read about Rahab protecting the two Israelite spies. Verses 4 through 6 tell us: "Rahab, who had hidden the two men, replied, "The men were here earlier, but I didn't know where they were from. They left the city at dusk, as the city gates were about to close, and I don't know where they went. If you hurry, you can probably catch up with them." 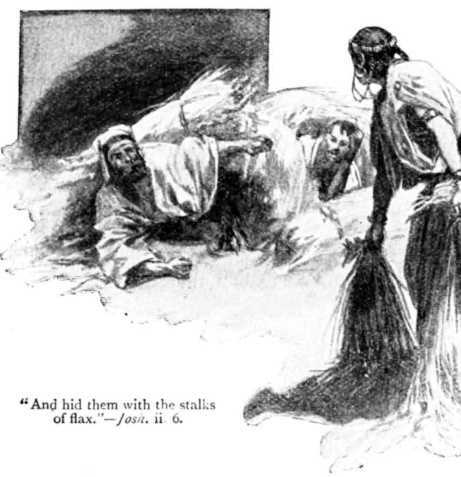 (But she had taken them up to the roof and hidden them beneath piles of flax.)" New Testament - Bible.org's wonderful commentary on Luke chapter 13's readings today titled "Striving to Enter the Narrow Door" is at this link. Psalms - Psalm 79 verse 13 stood out to me today - "Then we your people, the sheep of your pasture, will thank you forever and ever, praising your greatness from generation to generation." 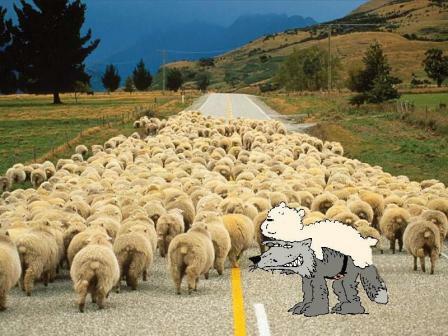 I like that imagery of being sheep in God's pasture. And Jesus, of course, is our Good Shepherd. 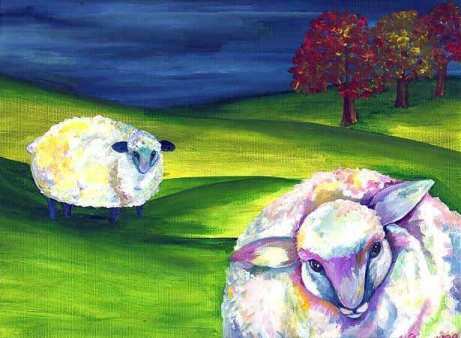 Are you content with the idea of being a sheep in God's pasture? Proverbs - Proverbs chapter 12 verse 26 today teaches us: "The godly give good advice to their friends; the wicked lead them astray." This is a great opportunity for us to reflect upon what type of advice or counsel we give to our friends. Is it wise? Or are we perhaps subtly leading our friends astray in any way? Worship God: Psalm 79:13's discussion of praising God from generation to generation reminded me of the importance of loving our children well and modeling for them life in Christ. This reminded me of the great song by Steven Curtis Chapman about his daughter called "Cinderella:"
Are you dancing with God? Click here to dance! Prayer Point: Pray for strength. Pray for courage. Pray that you will not be terrified, nor discouraged. Pray that you know that the LORD your God will be with you wherever you go, now and forevermore. Comments from You & Questions of the Day: How has your journey through the first 5 books of the Bible, the Pentateuch or the Books of Law, been for you this year? Have you ever read all 5 of these books in a row before? Are there any new insights you have learned from Genesis, Exodus, Leviticus, Numbers and Deuteronomy this year? Also, what verses or insights stand out to you in today's readings? Please post up by clicking on the "Comments" link below! Three times, count them three times (Joshua 1: 6,7,9) God gives the command to Joshua to “Be Strong and Courageous.” God doesn’t ask him how he feels, “Joshua do you feel strong and courageous?” God tells him to “Be …” We deal so much with our emotions and feelings. We operate by our five senses and then whatever our emotions and senses are telling us, that is what we tell ourselves must be truth. But here God is commanding a response based on His Word, not on feelings. In the same way we are commanded, as Christians, to love one another. It is a command not a feeling. I believe that these responses God had commanded us, has commanded Joshua to “Be” are all acts of the will and not responses of the flesh and emotions, and my beliefs are not based on my feelings, because I certainly don’t feel strong, nor courageous nor do I feel love for all my fellow man, but I am commanded to do and to be. So these three things I’ve mentioned, plus others, must be verbs, actions words. I just not sure how to activate the action or is it as simple as being and doing despite what it feels like? We know we have brains, at least I hope we know that, but when was the last time we felt them? Truth is not dependent on our feelings. Just because we feel or don’t feel a certain way or evoke a specific response as dictated by society doesn’t mean we are not dealing in “truth” or that we are insensitive to the needs, fears or experiences of others. Joshua’s foundation in carrying out the command is rooted in him not letting the Book of the Law depart from him, meditating on the Law and studying it as well. Since God is not a respecter of persons and is the same yesterday, today and forever, then my fears, my weaknesses are wiped away by doing the same thing, meditating, studying and not letting the “Law” of God, the commands of Jesus depart from me. It is also fascinating to note that the effects of hanging on to the Book of the Law, which gave Joshua strength and courage translated out to the citizens of Jericho as fear. Joshua 2: 24"The LORD will certainly give us the whole land," they said, "for all the people in the land are terrified of us." Jesus was not sidetracked by the needs of others, or the distractions of the towns he visited or passed through. His miracles, His Words were directed to a single purpose, the cross, and that could only take place in Jerusalem. When one knows his or her purpose they are not held in slavery to the agenda’s of others. His purpose was about doing His Father’s business and that business was acquiring our redemption. When you following your God given assignment death, physical death, will also be given its proper perspective in the life of the believer. Jesus was not rankled by the threats of Harod because He know that life is more that the physical, and because His Father, my Father, your Father, our Father is the God of the resurrection of all dead things. This verse reminds me that our righteousness, our deliverance and our salvation are not based on anything I’ve done but it is based on His Name’s sake, Jesus. I have no right to demand the benefits of Jesus’ work on Calvary, but it is only His love and mercy that has removed my sins from me and caused Him to bestow forgiveness on me. Thank you Jesus. This Proverb has not only caused me to reflect on the kind of advice I’m giving my friends, Mike, but it also warns me that I need to question whether the people who give me advice are Godly. Yikes!